Indonesia might be a famous, beautiful holiday destination for backpackers and sun worshippers alike, but it also has a reputation as a place where cats and dogs are sold in markets for their meat. Thankfully, after much pushback and campaigning on behalf of animal rights groups, the Indonesian Government has just made an announcement that plans to turn that reputation around, and improve and save the lives of thousands of animals in the process! A “National Coordination of Animal Welfare” meeting in Jakarta held on August 1st and 2nd hosted the announcement that the Indonesian Government has pledged to ban the cat and dog meat trade throughout the country, bringing an end to a practice that has horrified animal lovers internationally. The meeting was attended by experts from livestock and animal health departments, animal quarantine agencies, veterinary faculty academics, the Indonesian Veterinary Medical Association, and several non-governmental organizations from all provinces in Indonesia. We are thankful that these experts were able to make the Government sit up and listen! In a press release, Mr. Syamsul Ma’arif DVM, M.Si, Director of Veterinary Public Health, warned of the impact this dog and cat meat trade is having on animal welfare in Indonesia, though he also pointed out its effect on tourism, commenting that “foreign countries find a low standard of animal welfare and cruelty unacceptable and will stop visiting Indonesia which is very bad for our tourism.” The tourism industry was dealt a blowback in 2017 when it was discovered that tourists were given dog meat under the guise of chicken satay. Images from Tomohon Market in early 2018 revealing the extent of the conditions and treatment of these poor animals led to Trip Advisor removing its promotions of the city’s market. Only days earlier, Dog Meat Free Indonesia (DMFI) had issued their own public warning that tourists to Indonesia were being exposed to rabies because of the illegal dog and cat meat trade, coming at an important time since the country is due to host the 18th Asian Games in just under two weeks. 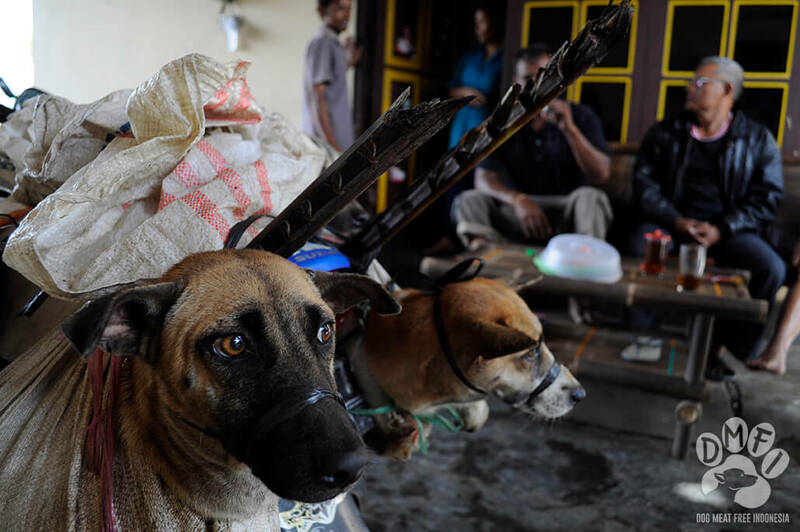 93 percent of people living in Indonesia also disagreed with eating dog meat, which makes you wonder why the practice has been allowed to continue for so long! A global petition by DMFI collected more than 930,000 signatures from around the world, including those of Cameron Diaz, Chelsea Islan, Dr. Jane Goodall DBE, Sophia Latjuba, Simon Cowell, and Ellen DeGeneres. The world has been watching Indonesia’s handling of the meat trade situation, and we are excited that the Indonesian Government is finally paying attention. We will continue to follow the news about the ban on the trade in Indonesia, but for now, we will celebrate this victory! How anyone can treat a living creature this way God only knows. The barbarity, knows no bounds. These Asian countries are all cruel to animals. What\’s the matter with them, something missing in their brains? Round the cruel nutters up and get shut,the sooner the better!Scum of the earth.